Only the first picture came out halfway decent ... the others are too dark to tell what it is. Put the bike in the driveway in full sunlight, and take a few more. From what I can tell, that looks like it MAY be a Lucky 7, which is the best of the best of the Chinese-made air-cooled bikes. 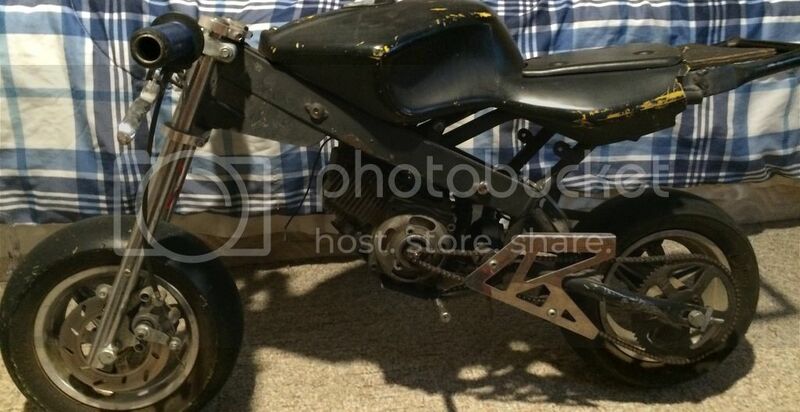 I can't be 100% certain on that, though, but the girder frame and removeable swingarm makes me think that's what it is. Yah, that's a 7. Good bike. why does it start bogging when i hit top speed? -Not enough gas flowing into the carburetor. Gas flow: replace all lines with 1/4" fuel lines. Do the petcock mod, and install an inline fuel shutoff valve. Some people also bore out the barb on the bottom of the gas tank a little larger, too. Top end reed flutter is when the reeds in the engine are flapping back and forth so fat that they can't make a good seal on the cylinder. Poor seal = loss of compression and power. Solution: change reeds out to better ones, such as carbon fiber or fiberglass. You can also change to a triple-stage reed set, such as the Black Widows, or do davation's cheap triple stage reed mod by cutting up the old tin reeds and layering them over a set of new reeds in your engine. yeah ill probably bore the hole a lil bit and change the gas lines cuz idk how to do that petcock mod thingy. Petcock mod is easy - all you need is some J-B Weld. Take the petcock apart - the only piece of it you're going to use is the body. Lay the petcock body face-up (hole facing upwards) on the counter, and mix up some J-B Weld. Where the white knob was, you're going to fill in that hole. Once the J-B Weld has dried, stand the petcock up like you're installing it back on the carburetor. Now, get your drill, and very carefully go straight down through the barb on the top of the petcock, all the way down through the bottom hole. (Btw, don't forget to remove that O-ring on the bottom for this part, or else you'll tear it up and need to buy another.) Once you have it drilled out, re-install on the carb. Basically, what you're doing is making the petcock into a straight pipe, which is why you need the inline fuel shutoff. As for the pullstart, sounds like you're pulling it too hard. When you pull, don't go all the way to the stop - do like a 3/4 pull. [quote=SpyGuy;457463]Petcock mod is easy - all you need is some J-B Weld. Take the petcock apart - the only piece of it you're going to use is the body. Lay the petcock body face-up (hole facing upwards) on the counter, and mix up some J-B Weld. Where the white knob was, you're going to fill in that hole. Once the J-B Weld has dried, stand the petcock up like you're installing it back on the carburetor. Now, get your drill, and very carefully go straight down through the barb on the top of the petcock, all the way down through the bottom hole. (Btw, don't forget to remove that O-ring on the bottom for this part, or else you'll tear it up and need to buy another.) Once you have it drilled out, re-install on the carb. Basically, what you're doing is making the petcock into a straight pipe, which is why you need the inline fuel shutoff. do u think that i blew tha engine? Last edited by locdog; 05-03-2010 at 11:28 PM. Out of gas .............? Spark? Maybe the coil loosened up a little, and it's not gapped properly. What's the bike doing, besides not working? Turning over okay, no grinding noises when you pull it? Let us know exactly what it's doing. should i maybe try starting fluid? Last edited by locdog; 05-04-2010 at 02:20 PM. Last edited by Bjr_22; 07-13-2015 at 06:36 PM. How many inches are the rims, and what the numbers on the side of the tires?? It says my picture is too big to upload, but when i click yes for resize it doesnt do anything either so idk how to post a pick of it? Idk how to upload a picture?! 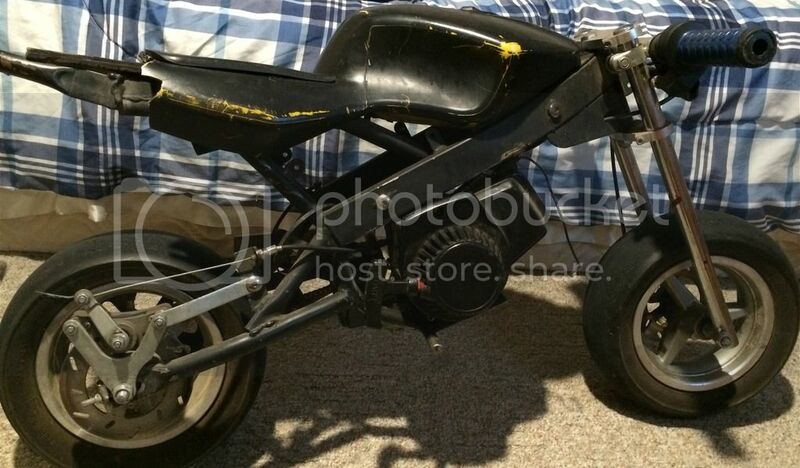 531 Attachment(s) New to little bikes.